Usually when you hear the words low fat you think of bland, dry, or flavorless baked goods. I’m happy to report that is not the case with these muffins. These are moist, chocolately, and flavorful! And as an added bonus, they are easy to make and don’t even require a mixer. Since it’s Mother’s Day weekend and I’m down in San Diego at my parents’ house, I wanted to make these for my mom. After going through her cupboards, I realized she doesn’t have a mini muffin tin so I decided to double the recipe and make a dozen regular size muffins rather than 18 mini muffins. (From my experience, three minis usually equal one regular size muffin.) I also used whole wheat baking flour instead of all-purpose flour and Splenda instead of sugar. You can’t even tell I made any substitutions. Preheat the oven to 350 degrees F and position a rack in the center of the oven. Measure all of the dry ingredients in a medium sized bowl, and whisk together. In a separate bowl, combine all of the wet ingredients and whisk to combine, trying to get as many lumps as possible out of the sour cream. Pour the wet ingredients into the dry ingredients all at once and stir to incorporate. Once mixture in combined, fold in the chocolate chunks. Grease a mini muffin pan. Scoop the muffin batter into a tin with a tablespoon measuring spoon, using one tablespoon of batter per muffin cup. Bake for 10-12 minutes or until a cake tester inserted in the center comes out clean. Let cool in the muffin tins for 5 minutes then transfer to a wire rack to cool. Recipe from Joy The Baker. Those look awesome!!! I’m so glad the recipe worked out for you! Hope Mom liked them! Ok, you got my attention at the low fat part – I’m constantly looking at ways of changing up anything chocolate to a lower fat version. These would work. Oh my. A food blog? I haven’t had breakfast yet. I was searching for lowfat/lowsugar muffins this morning. Nice to come across another one! Now, usually “low fat” sets off alarms in my head, but these look incredible!!! Yum. Of course, seeing this after the full-fat crumb cake I just ate…is making me feel rather the opposite of virtuous. Hey, just stumbled accross your blog while browsing food blogs. Apparently I’ve just found another one to add as my ever-growing list of food blog bookmarks! 😀 Your bakings look so interesting and I have a huge craving to start baking right now… Too bad my current situation restrains me from baking for a few weeks(!!) but I promise to keep checking on you and hopefully soon get to try something! Good luck with future bakings! I can’t believe these are low-fat?! They look full-fat and delicious! Great recipe, I can’t wait to try it out! 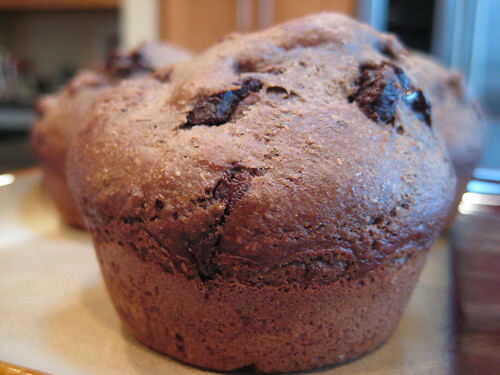 Chocolate muffins are a weakness of mine – and the fact that is low fat makes want to indulge that weakness.